110 Creations: PJs, dresses, and pullovers oh my! It snowed this week. Boo. I like snow as much as the next Midwestern person, but it belongs in December, January, and February. Not November. Unless it's the day after Thanksgiving. There are a lot of rules. Anyway, it was time for some winter clothes for AB. I typically buy her jeans and pants (second-hand) and focus on making fun things like long-sleeved t-shirts, pajamas, and play clothes (with a fancy dress thrown in every now and then). I spent a weekend being productive and churned out a few things for her. The first is a pair of pajamas. These are made with the Alex & Anna Winter Pajamas pattern from Peek-a-Boo Pattern Shop. Fabric from an accidentally purchased all-chevron bargain bin (so. much. chevron.) from Girl Charlee. My favorite part is the extra topstitching I did on the elastic waistband. Next up is an upcycled t-shirt dress that I made from the Peek-a-Boo Varsity Cowl Neck Pullover (can you tell I have a thing for Amy's patterns? I was a fan long before I became an affiliate). The original t-shirt was given to me by my parents, specifically to make into something for AB. I made the top portion from the pattern, and then added the bottom of the shirt as a skirt to complete the dress. Like I said, I made these in a weekend, and mostly with my serger (<--- aff link, but believe me, that is a REALLY good price!). It makes everything go so much faster (and without cursing over wavy seams!). People are right when they say to buy a serger if you sew with knits a lot. So that's what I've been up to lately! A lot of stash busting and upcycling. Time to turn my attention to holiday sewing. With or without the snow. Are you making a pretty dress for the holidays? 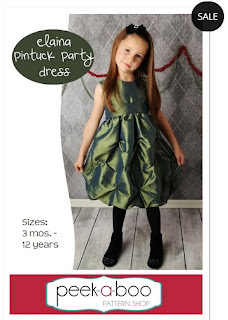 Try the Elaina Pintuck Party Dress pattern, today's Thrifty Thursday deal! Get the pattern for $4 today only.